The subtly musical performances by three considerably talented Toronto musicians of six newly written or improvised pieces have much to offer. And as these musicians are still virtually discovering themselves and defining their sound they are sufficiently exceptional to stand out in what is now becoming a crowded field of Canadian musicians. Certainly the quietly expressive way in which pianist Jack Bodkin, bassist Mark Godfrey and drummer Eric West play such pieces as ‘Undercurrent’ with its understated, bare triads and octaves gives us a fine example of the self-effacing poetry that is one of the hallmarks of this disc. There are pianists who make more of a solo-opening of pieces, bassists who solo for one-too-many choruses and drummers who thunder when they should sizzle. Pram Trio do none of the above, Bodkin is almost too quiet but does play with extraordinary expression and dynamic, Godfrey is melodic, tuneful and has a compelling gravitas and West plays with that sizzle that most drummers seem to evade. This is Pram Trio’s territory; a place where rich tonal colours abound, where experimentalism nuzzles cheek-by-jowl with interesting and challenging compositions. Where music soars aloft with chaste tenderness that captures the reflective mood to perfection. Try ‘April’ and ‘Treptower Park’ to hear what I mean. Of course, you can always be adventurous and just jump in. 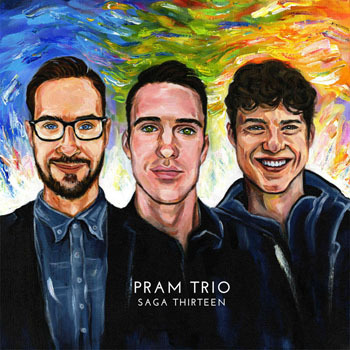 The music of Pram Trio on this album, Saga Thirteen, takes a decidedly elegiac view of both composition and improvisation. Individual musicians encourage each other never to play with undue gruffness. As a result there is never a clash of tonalities and timbres. It is as if musical palettes have been mellifluously mixed and the pieces that emerge as a result have a great sense of congruity and an even greater sense of forward momentum. This consistent beauty is captured by an engineer with sensitive ears. The result is a very fine recording indeed, well worth adding to the library of the aficionado. Track List: April; Bucket List; Mrs. Kim Visits the Living Room Alone; Control; Undercurrent; Treptower Park. Personnel: Jack Bodkin: piano; Mark Godfrey: double bass; Eric West: drums.